I am probably one of the only people who really doesn’t like the Lord of Misrule scent!! 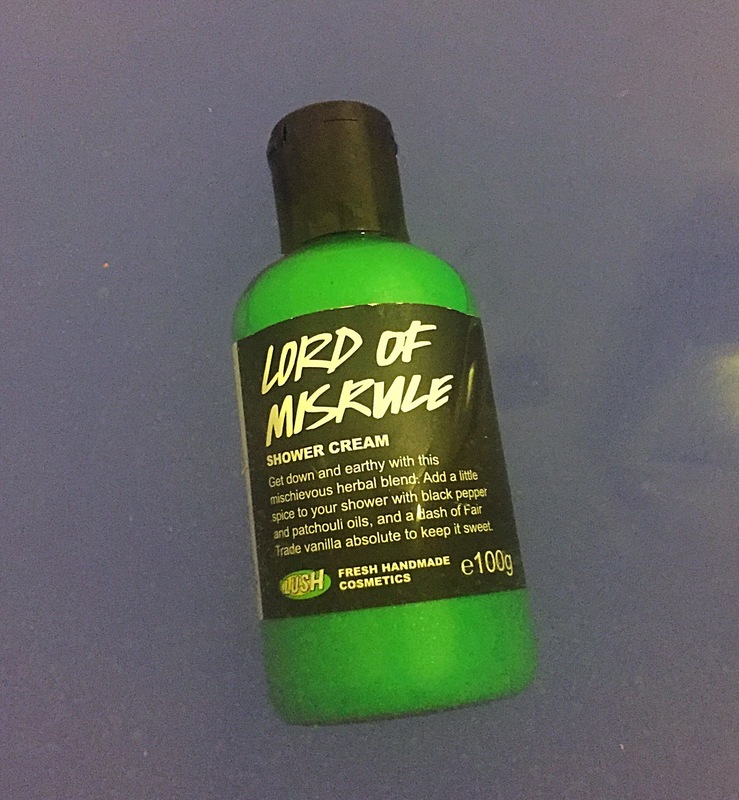 Lord of Misrule is a holy grail product for many and has gathered a huge fan base much like that of the snow fairy scent. The scent first started off in the bath bomb format and was turned into a shower cream to the delight of many last year (2015). Black pepper and patchouli oil give this shower gel a spicy and earthy kick with vanilla absolute to give it a sweet element. I personally like very sweet or fruity scents so this shower gel is a little to spicy for my liking. Although the scent might not be my cup of tea, the colour of this shower cream is incredible. It’s a very vivid green which makes it stand out from all the other shower gels and creams lush have to offer. It also has a hint of lustre which means it ever so slightly shimmers in the bottle. I love this is a Halloween product as I think it look a bit like slime making it brilliant for the halloween season. However it is also available all year round the the Oxford street store. As this is a cream rather than a gel it is meant to be a little more moisturising on the skin. I did find the I didn’t lather up quite as well as the gels do. But my skin felt lovely and soft after I used it. The scent is also nice and strong meaning it lingers on the skins throughout the day which I fab if you like the scent, not so much if you don’t. Overall although I don’t like the scent, I would still recommend this product if the scent family is your cup of tea, as the product is lovely to use and leaves the skin very moisturised. INGREDIENTS: Water, Sodium Laureth Sulfate, Patchouli and Peppercorn Infusion, Sodium Cocoamphoacetate, Glycerine, Stearic Acid, Lauryl Betaine, Perfume, Lactic Acid, Organic Wheatgerm Oil, Black Pepper Oil, Patchouli Oil, Fair Trade Vanilla Absolute, Titanium Dioxide, Limonene, Linalool, Snowflake Lustre, Colour 42090, Colour 47005, Mathylparaben, Propylparaben.